Rauma Marine Constructions and Kvarken Link, who have commissioned the vessel, signed a letter of intent concerning the vessel one week ago (11.1.19). The following construction agreement was reached quickly and both parties thank the Ministry of Transportation and Communications of Finland, the Ministry of Economic Affairs and Employment, and the Ministry of Finance for enabling the quick execution of the agreement. Rauma Marine Constructions and Kvarken Link have signed a construction agreement for a car and passenger ferry, set to operate between the Finnish city of Vaasa and the Swedish city of Umeå. Following the agreement, the planning of the vessel can begin with immediate effect. “We reached an agreement in a little over a week after signing the letter of intent. Now begins the real work. We would like to express our appreciation to the ministers and officials at the Ministry of Transportation and Communications of Finland, the Ministry of Economic Affairs and Employment, and the Ministry of Finance, for their role in making this project a reality,” states Jyrki Heinimaa, Chief Executive Officer, RMC. 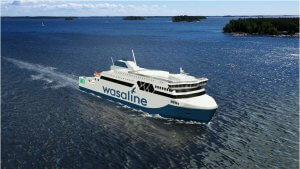 The ferry will be completed in 2021 and will operate daily between Vaasa and Umeå. Kvarken Link, who have commissioned the vessel, are owned by the city of Umeå and the city of Vaasa, both of whom serve as guarantors of the financing. The vessel order, with an approximate value of EUR 120 million, will have a positive impact on employment, totaling around 800 person-years. The ferry will accommodate approximately 800 passengers and will have a freight capacity of 1,500 lane meters for lorries. The vessel will be designed to be environmentally friendly, with machinery running on a dual fuel solution: besides liquefied natural gas it can also be operated using biogas. The ferry has an ice class of 1A Super, in order to guarantee that the vessel is able to navigate as independently as possible in the challenging ice conditions that are a feature of the Kvarken region. During autumn 2018, Rauma Marine Constructions also signed letters of intent regarding both a new ferry for Tallink, to operate the Helsinki-Tallinn route, and four combat vessels, as part of the Squadron2020 project. Due to the growing number of orders, RMC has increased their workforce at the shipyard. Additional recruitments will take place in the near future.